If you have any questions about the ARIOSO information page below please contact us. The motor yacht ARIOSO is a 40 metre 130 (ft) well proportioned composite boat which was constructed by Westport Shipyard and designed by William Garden and Gregory C Marshall. Sleeping 10 passengers and 7 crew, motor yacht ARIOSO was once called Lucky Seven as her shipyard project name and/or actual name. Completed by 2006 her reasonably recent internal styling reflects the worth from Pacific Custom Interiors and their approach to interior yacht design. 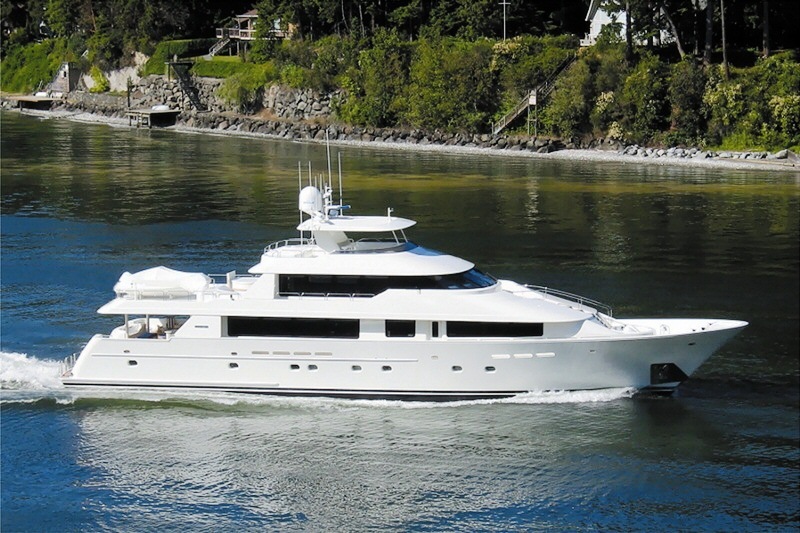 130ft Westport motor yacht ARIOSO is tasteful, spacious, and comfortable. She features state-of-the-art electronics and communications with v-sat wi-fi and zero speed stabilizers. The yacht has accommodation for 10 in an on deck master king, and 2 king and 2 twin staterooms below decks. A range of toys and In July 2009 at the Newport Shipyard, damage was caused to ARIOSO while docked, by ESPRESSO III during their docking procedure. The damage was superficial and cosmetic and no interruption to the charter schedule occurred. William Garden was the naval architect involved in the formal vessel design work for ARIOSO. Her interior design was completed by Pacific Custom Interiors. William Garden and Gregory C Marshall is also associated with the yacht wider design collaboration for this boat. In 2006 she was formally launched with accolade in Westport Wa and post sea trials and detailing was thereafter handed over to the new owner. Westport Shipyard completed their new build motor yacht in the United States. Her core hull was constructed with composite. The motor yacht main superstructure is fabricated predominantly from composite. With a beam of 7.92 metres / 26 feet ARIOSO has reasonable internal space. She has a shallow draught of 1.83m (6.6ft). Installed with 5 MTU diesel engines, ARIOSO is able to reach a maximum speed of 29 knots. Her propulsion units are twin screw propellers (schaffran 5 blades). She also has an economical range of 2300 miles when motoring at her cruising speed of 24 knots. Her total HP is 5470 HP and her total Kilowatts are 4025. With respect to thrusters she was built with Wesmar. With respect to the ship’s stabalisers she was supplied with Naiad. The good sized luxury yacht M/Y ARIOSO is able to accommodate as many as 10 guests and has 7 qualified crew. Range in nautical Miles is 2300 at a speed of 11.5 knots. The luxury yacht ARIOSO displayed on this page is merely informational and she is not necessarily available for yacht charter or for sale, nor is she represented or marketed in anyway by CharterWorld. This web page and the superyacht information contained herein is not contractual. All yacht specifications and informations are displayed in good faith but CharterWorld does not warrant or assume any legal liability or responsibility for the current accuracy, completeness, validity, or usefulness of any superyacht information and/or images displayed. All boat information is subject to change without prior notice and may not be current.